Alpha board testing This was developed for use in Suitsat-2 in collabration with AMSAT and TAPR. August 16, 2006: New project page. 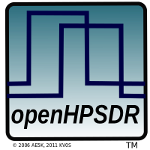 The Odyssey Project includes a low power SDR based on the QSD, QSE, and a dsPIC33 as the basic radio core. Odyssey will be more than an SDR and you may expect the wiki page to be dynamic and with the latest information (see link below). In Homer's Odyssey, our intrepid hero Ulysses has an interesting journey in this early classic. Project Odyssey was born at the Johnson Space Center during a design meeting for experiments we hope to be include on SUITSAT-2. SUITAT-2's journey will be at least as interesting and magical as that undertaken by Ulysses. In addition, we think that what we are doing for this project will enable low power, hand-held software defined radio objects to be built. This should enable you to take battery operated journey's with your SDR as well. 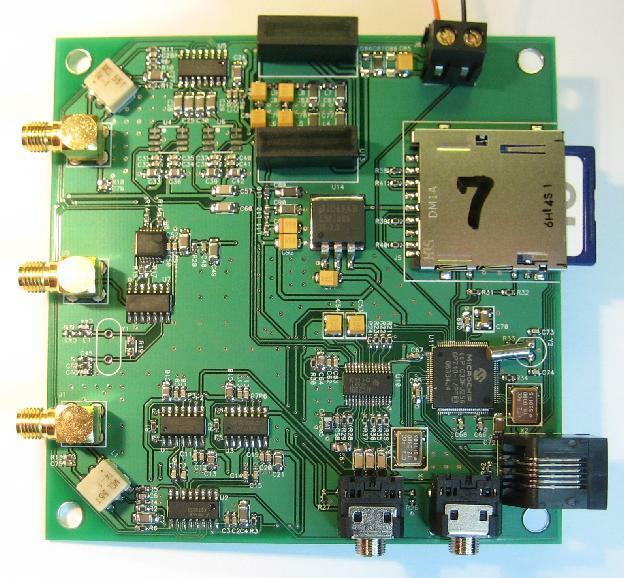 The guts of the RF/SDR is QSD, QSE, and dsPIC33. Joe, N9WXU and Steve, N7HPR both work at Microchip and have been generous with their time and talents. Joe is building both hardware and code to make a very interesting integrated housekeeping unit (IHU) for this project. IHU is "space speak" for on board control computer. Lou McFadin, W5DID, long time AMSAT contributor and board of directors member has been in the manned space program as a professional at JSC for 30 years or more before he retired. For AMSAT, he has done many projects. In particular, he has been instrumental in getting amateur radio on manned space missions from the first with Owen Garriot, W5LFL, all the way through to the international space station. Lou and Steve and a few others built the electronics for SUITSAT in a "few days" and got it flown. Keith Curtis, also of Microchip, is a power systems expert. He and Lou are designing an interesting power system for AMSAT that will allow the use of myriad battery types and charging sources, not limited to but including solar panels as a source and Ultracapacitors, Nicad, NiMH, and Li-Ion batteries as energy storage devices. The boost/buck system for matching cells to the main electrical bus and control of individual cells in a "battery pack" will greatly optimize battery charging and use. Bob, N4HY and Frank, AB2KT are are doing DSP/SDR on the dsPIC33. It has some limitations but we believe we can do useful transceivers, and transponder/repeaters with it. Expect to be able to mine Odyssey for all sorts of neat applications including everything from balloon and satellite packages to FM repeaters! Expect this project to be quite dynamic. Our delivery schedule for SUITSAT-2 demands that we move quickly so expect action. We are truly living in interesing times. WHY don't the young kids see how marvelous this stuff is? Hopefully AMSAT, HPSDR, and TAPR will help us recruit some great new talent from all around the world to amateur radio and beyond!